I love my readers. Since I started blogging a few months ago, I feel like I have this whole new group of friends that I can talk write to and listen to read about and I love it! Little reminders, like this award, remind me that my readers love me too =) Thank you, G.I. Joe's Wife, I think your blog is beautiful too! 1. Thank the person who nominated you for this award and link back to their blog. Thanks for the fabulous award, G.I. Joe's Wife! 2. 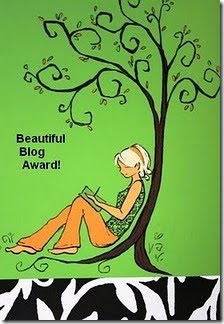 Pass the award on to 7 other bloggers who have a beautiful blog. 2. Errign @ 365 days! 3. Contact the other bloggers and let them know they won an award. 4. Say 7 things about yourself. 1. I type like I talk and I talk like I think. If you can keep up with it, you deserve a gold star. 2. Speaking of gold stars, that used to be one of my favorite things to say, "you get the gold star", and I kept a pack of gold star stickers in my purse and i would physically hand out gold stars to my friends. 3. I'm a dork. I know it and I embrace it! 4. I love, love, love to read. 5. My right wrist has been aching for the past few weeks and I think I have am getting carpal tunnel. 6. I often feel like I have no style/fashion sense. I'm afraid of patterns and almost ALWAYS just wear solid colors. 7. I love to be barefoot. Now I have to get some things done around the house so the hubs doesn't think I spent the entire day on the internet! Thanks! I just posted for the night, but I will try to remember this for tomorrow's post! I absolutely prefer to be barefoot too, but I live in a cold house now, so I pretty much have to wear socks. Im like you, I wear all solids. I envy trendy people. I wish I had a personal shopper! While the husbands at work, the wife will play..